Enter our Twitter contest to win a signed copy of Monster Hunters’ Survival Guide #1! Click to learn more. Let’s face it: most people don’t believe monsters are real. We live in a world dominated by pop culture and technology, and while teenage girls may get all aflutter about the vampires in Twilight, most people do not actually believe monsters exist. Well, do us a favor and put your skepticism aside before reading the following Zenescope Month interview. We had an exclusive opportunity to speak with John Paul Russ, who asserts he is a real-life monster hunter, much like his father before him. 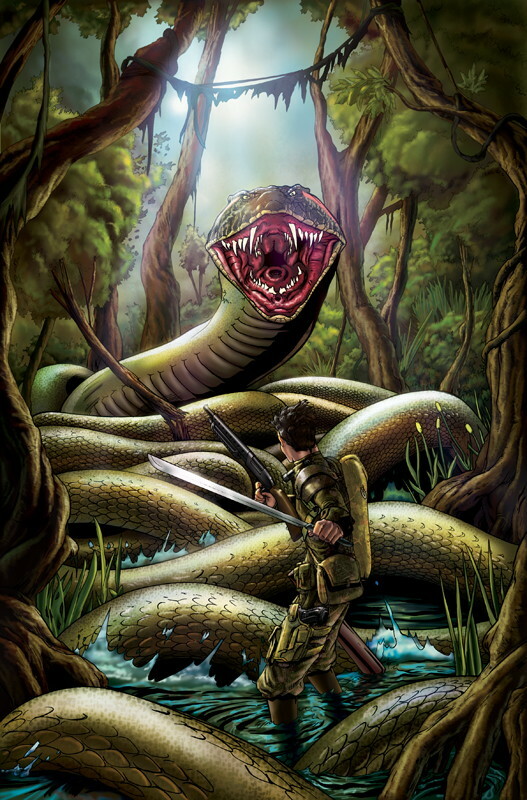 And he’s used his years of experience encountering real-life goblins and ghouls to create the Monster Hunters’ Survival Guide, a book chock-full of techniques and strategies to protect yourself in the event of an attack by creatures like vampires, werewolves, ghosts, and more! Illustrated by Anthony Spay, Shawn McCauley, and Andrew Mangum, this is a one-of-a-kind series you’ll want for your collection–whether you believe in monsters or not! TFAW.com: Hi John Paul, thanks for answering some questions about the Monster Hunters’ Survival Guide! TFAW.com: This seems like a really unusual series. Can you tell us what to expect? JP: Expect a lot of interesting and relevant information on hunting monsters and surviving potential monster attacks. I’m covering everything from vampires to werewolves to zombies to the Loch Ness Monster. This will be a comprehensive and interesting guide with illustrations. TFAW.com: What is the purpose of this series? Is it merely to inform readers about the different types of monsters, or will it really give them strategies to defend themselves? JP: It’s definitely more geared toward confrontations with various types of monsters. It also will discuss popular myths versus the facts. I wanted to be informative enough where it would help out both amateur and seasoned hunters, as well as those who just have a curiosity about monsters. TFAW.com: What types of monsters will be featured in each comic? 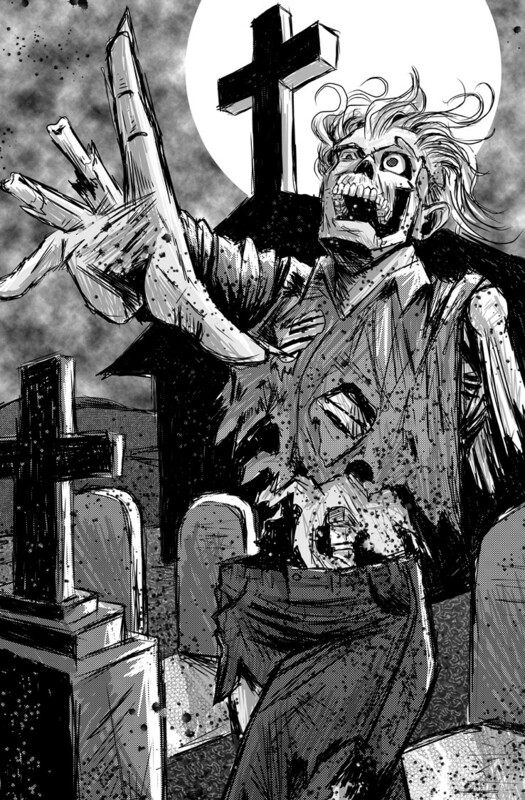 JP: The first issue deals with the undead like zombies, vampires, mummies, ghosts and more. 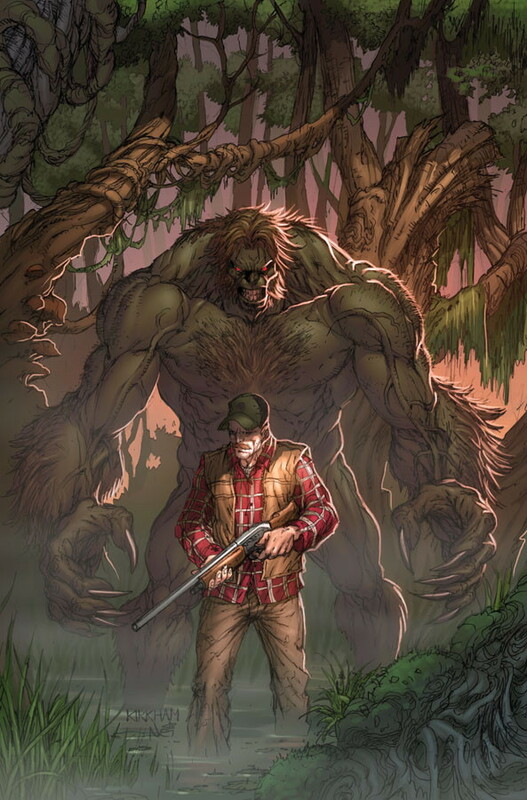 In issue #2 we’re delving into cryptids such as Sasquatches and the mythical Krakens. Other issues will examine unnatural beasts like werewolves and giant creatures like killer catfish and anacondas. TFAW.com: You’re a monster hunter yourself, in real life. How did you get started down that road? JP: My father was a hunter and taught me everything I know now. I was intrigued by it as a kid and started going on expeditions with him when I was 12 years old. So many people were skeptical of him and his encounters, but he was a modest man and never forced anything down anybody’s throat. He always said to me that people are not going to want to believe certain things and you can’t make them try and understand you. He hunted for himself and he found it extremely rewarding . . . as do I.
TFAW.com: We’ve all seen monster hunters in movies and on TV–how close are their experiences to yours? JP: Not very. Once in a while there may be something out there that strikes a chord, but 99% of the time it’s BS. My niece had me watch Twilight with her last year and I didn’t realize it wasn’t supposed to be a comedy until just a couple months ago. TFAW.com: When did you discover, for yourself, that these monsters are real? JP: My father once brought home a baby chupacabra he had captured. I was only seven or eight at the time. Right then I knew there were strange and mysterious creatures in the world, creatures that few knew about. And that’s really when I knew I wanted to hunt like my father. TFAW.com: Have you encountered all of the monsters you cover in the Monster Hunters’ Survival Guide? JP: Not firsthand, but the community of monster hunters is larger than you would think. Most of the information in the book comes directly from my own personal experiences, but there were several times when I called on other hunters and their knowledge. They were happy to help but prefer to remain anonymous. TFAW.com: What’s the scariest situation you’ve found yourself in with a monster? JP: They’re all pretty damn scary. That’s why I’m writing this book. Believe me, you do not want to go up against a werewolf or a zombie without it. But if I had to choose one encounter over all the others, I would say it was the first time I encountered a vampire. Let me tell you this, the weakest real vampire makes those Twilight pretty boys look like Count Chocula. TFAW.com: Do you hope to capture any alive? JP: I’ve captured, and killed, plenty of monsters. but not in an effort to prove whether they exist or not. I do it to protect the general population, who more times than not scoff at their existence. There are many creatures, like Sasquatches, who are mainly docile and just want to be left alone. But there have been times when even a Sasquatch has gone rogue, and that’s why every aspiring monster hunter needs to know how to take one down. Unfortunately, encounters like that generally happen because humans are encroaching on their natural habitats. TFAW.com: Where do you think monsters come from? Have they always been here? JP: Some of these species inhabited this planet well before humans. Look at it this way, dinosaurs could be considered monsters, but they just happened to go extinct prior to us (at least most of them did, see issue #3 for the ones that didn’t). There are various reasons monsters walk the earth. I have yet to uncover all of them, but I’m trying. TFAW.com: Which monsters are the most dangerous, in your opinion? JP: A Kraken can take take down a battle ship, but they rarely come to the surface, so attacks are few and far between. Vampires are extremely dangerous beings, as are werewolves. Zombies may be the most deadly. 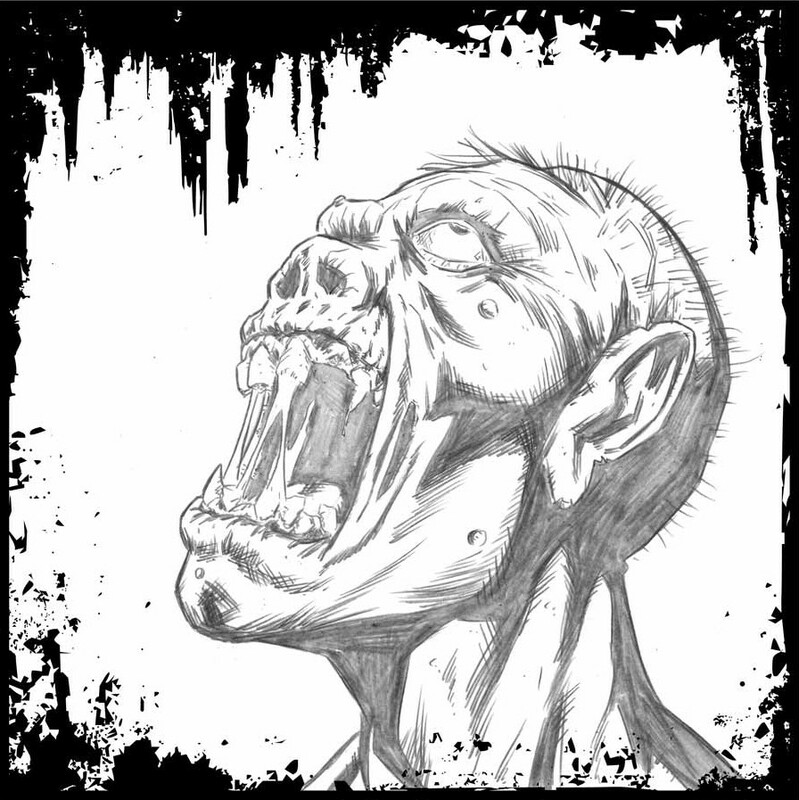 If left unchecked, a zombie outbreak could wipe out the entire human population, and that’s no bull. I heard Kirkman actually got his idea for The Walking Dead because he’s related to a monster hunter who told him how real and deadly they are. But I don’t know if that’s true or not. What I do know is that as long as there are monsters out there, us hunters will hold vigil for our fellow man. TFAW.com: Why do monsters attack humans? Is there anything we can do to avoid such attacks? JP: There are so many reasons, and I’ll cover those in my issues. Some are very aggressive and some are much less so. Some want to eat you, some want to turn you, and some just want to be left alone. Each type has its own agenda and intelligence level, that’s for sure. TFAW.com: What do you say to people who are skeptical that monsters really do exist? JP: I say to each their own, but don’t come crying to me if you’re attacked and unprepared . . . although at that point you’re likely not breathing anymore. TFAW.com: Did you advise any of the artists for the Monster Hunters’ Survival Guide? JP: [I told them] don’t turn this into a damn cartoon. 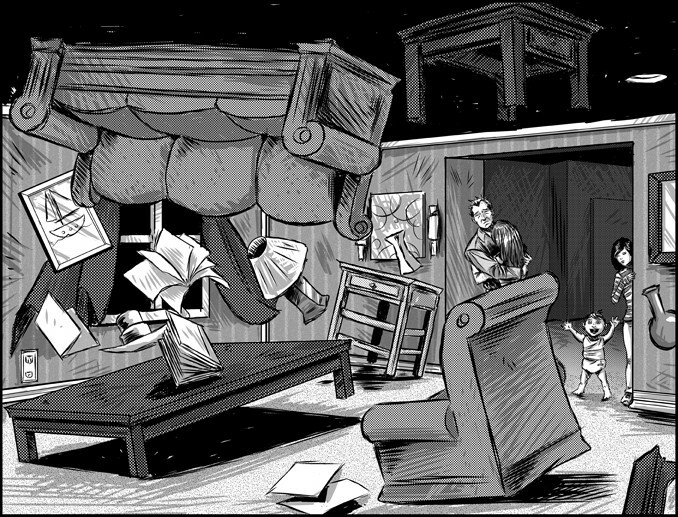 TFAW.com: How many issues will the Monster Hunters’ Survival Guide be? JP: It’s five issues. And it’s very informative. I have to say, the artists (Anthony Spay, Shawn McCauley, and Andrew Mangum) did a really nice job on this book and I’m happy with their choices. TFAW.com: What made you choose Zenescope as your publisher? JP: They’re the best for what I wanted to do. Joe and Ralph understood my vision and supported me from day one. In my humble opinion these guys have set the tone for horror and supernatural comics over just the four or five years they’ve been publishing. Zenescope is one of those companies that feels like it’s been around forever, but hasn’t. That’s because they are so good at setting themselves apart from all the others, and that’s how I am. It’s why I knew we’d be a good fit. TFAW.com: What other projects do you have coming down the road? JP: A couple of networks have approached me about doing some reality stuff. I’m not completely against it, but it would need to be done right. I’m not a fraud like most of the other “reality” people out there now. I’m just not sure the world is ready to witness what I do just yet. Do you believe in monsters? Order the Monster Hunters’ Survival Guide today and judge for yourself! Plus, you can still save 20% if you order now. What’s better than owning the whole series? Winning a copy of the Monster Hunters’ Survival Guide #1 signed by John Paul Russ himself! Enter our Monster Hunters’ Survival Guide Twitter Contest now through 10/27 to enter to win one of 25 copies. Have you ever encountered a real-life monster? Post your comments below! Next article Two New TFAW.com “Battle” Commercials–Which One Is Best? Elisabeth has been reading comics since we was a wee girl. She's obsessed with John Byrne, Criminal by Ed Brubaker and Sean Phillips, and making the perfect scrambled eggs. Follow her on @Twitter to get bonus conversations with her cat! Battlestar Galactica‘s Next-to-Last Episode Airs Tonight!